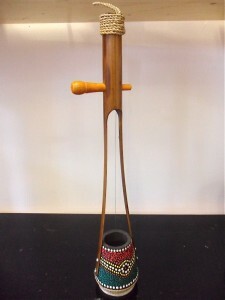 The Gobijeu is a one stringed, Indian instrument. You bend the note by pressing the bamboo sides, while plucking the string.You can change the note by turning the tuning peg. Great fun,but it also has a classy musical past-featuring in 'Dream Brother' by Jeff Buckley ! 49cm high x 10cm diameter. Hand painted, so colours and designs vary.